Prepare yourself for an engaging album from a seriously talented band, with a super-sweet name! 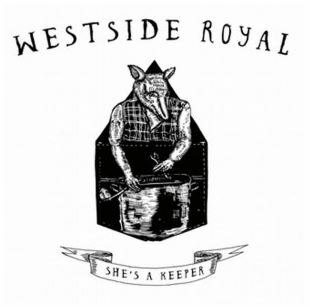 Westside Royal is a five-track digital album released by She’s A Keeper in January 2015, on the heels of their full-length release Sterlin from 2013. This little gem is an energetic and upbeat treat for your commute, or it also works as little fun background music for a productive Saturday afternoon. The first song is “Wannabe”, and sets the album off to an interesting start featuring strong chords with melodic vocals. This sounds like a heavily harmonized version of Vance Joy with a little Modest Mouse mixed in there. I would say the vocalist reminds me of the primary singer from the Head and the Heart, but the style is way different (and way more rocking). The second track remains upbeat, with a 60s-feeling blend of Nick Drake, CSNY, and even Band of Horses – the opening reminds me musically a bit of Mindy Smith’s hit single “It’s Amazing”. The feel of this song is echoey and rhythmic, with great harmonies that I really enjoyed. Next is “I Won’t”; something just a little darker, and more emo – with buzzy reverb on the guitars and banjo-esque strumming popping through the texture. These broken, jazzy, arpeggios break through to crashing guitars every now and then, to create a great level of complexity here under the smooth vocals and sensitive lyrics. And again the vocalist reminded me of the Head and the Heart – with a David Gray comparison presenting itself more obviously than ever. “Dead Serious” is the 4th song, and this one will have you moving your feet! The guitar chords in the intro have a surf rock feel – with a little clashing/dissonant tension in there, under laid-back vocals that complement this bustling and complex musical background. The overall effect is more of an “indie folk revival” feel than some of the other songs; in fact I would say this is definitely similar to Mumford and Sons. I would personally shout that this group is worth checking out – I really enjoyed the 5-tracks on Westside Royal as an intro, and I look forward to hearing the 2013 full-length album too. You may also appreciate the local interview done by Kansas City’s own music and entertainment publication, the Pitch (www.pitch.com). The band has a few show dates scheduled in Missouri and Wisconsin, so you might be able to experience them live – if you are lucky! *Please note: This piece was originally posted on EarToTheGroundMusic.co on May 10, 2015 – the image shown was captured from that website. The article itself was written by rockmycommute and is subject to my copyright notice as detailed in the About link.